There is something to be said for companies that focus on specific products and minimize their range to really get things right. This bears out when considering Aston Microphones, whose line-up currently includes just two large diaphragm condensers, one small diaphragm condenser and one microphone screen, albeit available in two colours. Recent reviews of the microphones have suggested that their price belies the quality, with favourable comparisons to much more expensive options, but it is the screen which is the subject of this review. In the world of music technology, talk is almost universally directed to how a new plug-in, DAW or retro hardware compressor clone can improve the sound of your mix. However, having conversations with, or reading forum posts by the experienced old guard, you will find these things come further down their list of best practices. In general, they cite good musicians and instruments, good mic positioning and good acoustic properties of the room to be much more important if you want a great end product. With this last factor in mind, and with the advent of the ‘bedroom producer/musician’, portable microphone screens have become a hot topic over the last decade. 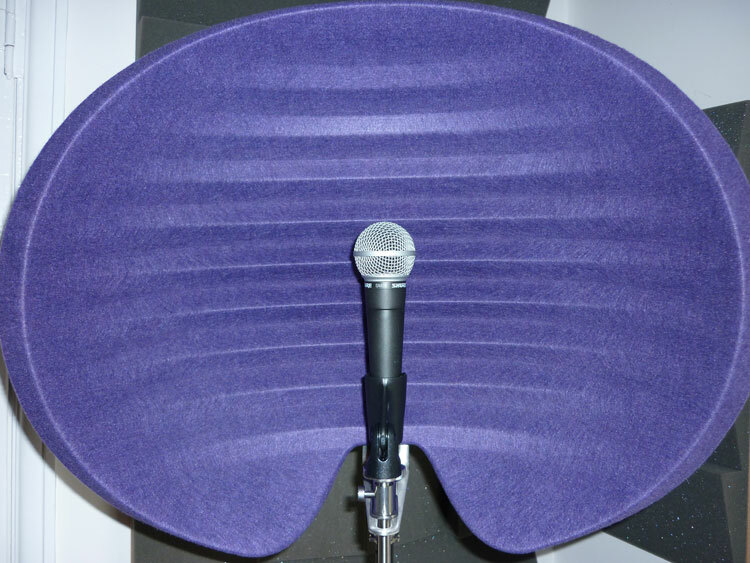 The principle behind these screens is two-fold; firstly, by wrapping around the microphone, they will effectively reduce the amount of reflections bouncing back into the mic and, secondly, they would hopefully reduce the amount of sound being transmitted into the room itself by absorbing some of the energy in the first instance. So, does the Halo have what it takes to be a player in an already competitive and crowded market? It should be noted that, while this review is based on the original purple Halo, the specifications for its sibling Halo Shadow (finished in all black) are identical and should be considered for that product as well. The first thing to notice about the Halo (ok, the second thing after the very purple hue) is the size. The screen is considerably larger than any others I have used before and because of this you couldn’t necessarily call it portable. Don’t get me wrong, it’s very light and manageable but, because of the construction, it is a solid single piece and cannot be folded, unlike some of its rivals. It is 530mm wide, 460mm from top to bottom and has a shell-like appearance as it is engineered to reduce reflections from above and below, as well as from the sides. Upon setting it up (very quickly, see video) on a mic stand, I moved my head into the shell while talking out loud and immediately sensed the room sound disappearing. Odd, I thought, so I did it again. Sure enough, the result was the same. I couldn’t perceive any colouration to the sound of my voice, but putting a microphone up would obviously be the true test of this. 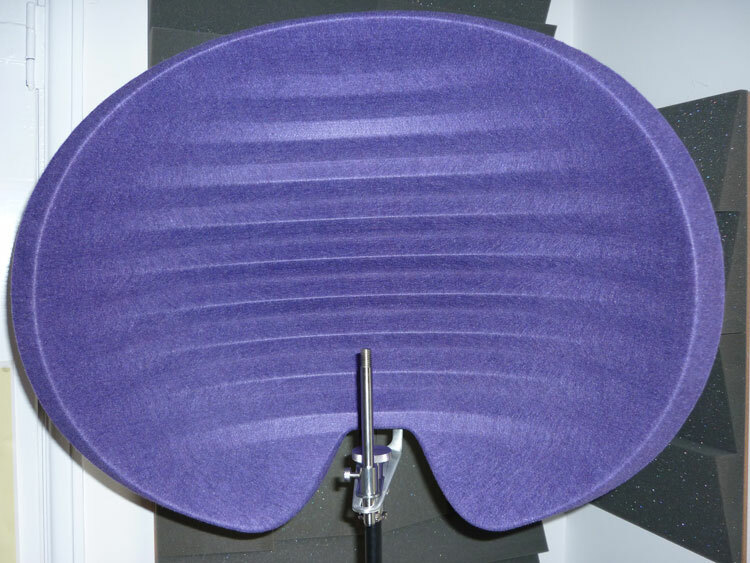 Whereas some reflection screens available are made using layers of metal and foam, the Halo is made from a Polyethylene Terephthalate (PET) material in two slightly different forms. The outer shells are formed into a rigid shape with a felt-like texture and, internally, a more loose foam style core is sandwiched between them. The PET material is made from 70% recycled plastic bottles, which helps to keep the weight down to a relatively light 1.85kgs including the metal mounting hardware. However, due to the way the screen is balanced, it does not feel like a chore to offer it up for placement on a microphone stand. The inner space in the shell is also ridged so, if energy at a particular frequency is not absorbed, it has a good degree of dispersion if it is reflected back. Once attached to a mic stand, the screen is really well balanced and doesn’t feel like it’s going to topple over. This was indeed borne out when I tried the screen on a stand with a round base of around 24cm and it was still happy to take the weight of the mic and screen without toppling over. 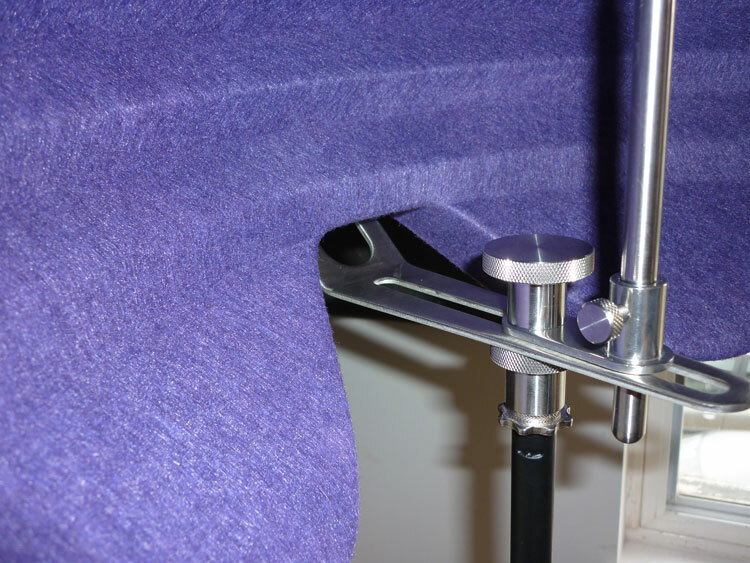 The mounting hardware is a simple affair offering a large knurled knob to move the screen horizontally and a smaller, metal post and associated thumbscrew to give movement to the microphone vertically. The quality of the engineering is clearly obvious here, as you only need to gently tighten these elements to get the clamps to hold firmly. Usefully, there is also a cutaway to the rear of the hardware so you can pass the XLR cable into the structure, rather than having it hang down directly from the microphone. And it’s as simple as that – mount your mic and you’re ready to go. For the tests, I used a large diaphragm condenser set to a cardioid pattern, as this is the most likely choice for a vocal track. To begin with, I set the screen at the furthest distance possible behind the microphone and began recording some spoken word. As expected, the screen offered a great solution to cutting down room sound being picked up by the microphone, making the signal clean with a good reduction in audible reflections. Making comparative recordings with a screen I already own (albeit smaller in size) and no screen at all, it was clear how much the Halo was helping to really tighten up and focus the vocal sound. Next, I wanted to hear if there was any audible difference to the sound if the microphone was moved further into the shell of the filter. I was pleased that, not only did it further reduce room sound, but this was also without any noticeable colouration of the vocal sound itself, which showed off another quality of the screen. The obvious downside to this is if the performer needed to see a music stand with lyrics on, but this is a common problem that I’ve noticed with all these types of devices as they are always in eye line. Perhaps someone could invent a solution to that one…? Although the effectiveness could be put down to the material used, I would suggest that it is the enveloping shape that contributes more to this, as cutting the reflections from floor and ceiling is just as important as from the walls and this is a great design point on Aston’s part. There are some vocal screens that take this a step further by encompassing the microphone almost completely, but this is perhaps a bit too far as the microphone still needs some air to move around it to work properly and Aston appears to have the balance just right. Of course, a large amount of reflected sound could come from behind the performer into the hot side of the mic and so you will still need some additional treatment to minimize this. However, due to the ease of use of the Halo, the construction principles and shell-like shape, this is possibly the best all-rounder currently available and goes to the top of my list should I need to invest in a replacement screen in the future. Strongly recommended.